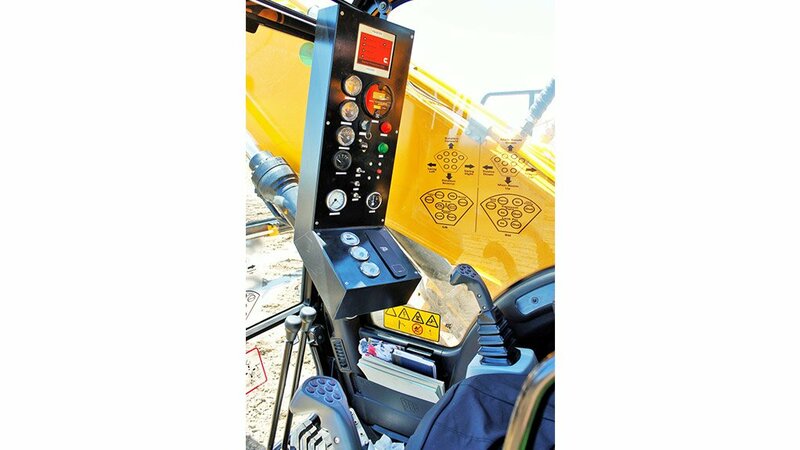 The conversion of a JCB JS205 excavator into a drilling rig has produced a machine that rewrites the efficiency, productivity and safety rulebooks. 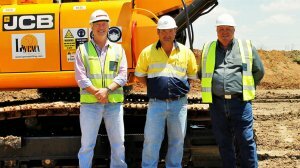 The innovation, which stems from a partnership between three specialist companies - Kemach Equipment (Pty) Ltd., Liyema Drilling and Integrated Air Solutions, combines a premium excavator with a premium compressor and a locally designed, tailor-made drilling tower that conforms to all OEM specifications. To achieve this seamless 3-in-1 integration, the companies worked closely on a solution, dedicating their respective technical expertise. Basie Roelofse and his team from Liyema Drilling, a Level 2 BBBEE 87,5% black-owned company, was responsible for converting the JS205 excavator into a drilling machine. Basie explains that mines are under constant pressure to improve efficiency, production and safety. 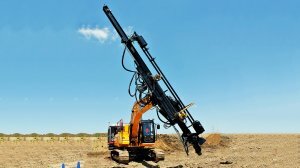 Liyema Drilling is currently operating the JS205 drilling machine at Kangala Coal Mine in Delmas. 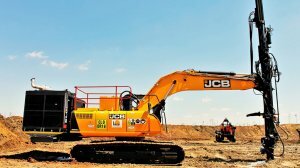 “The JS205 has reduced our set- up time from seven minutes to an astounding 11 seconds which enables us to complete between 450m to 750m in a single 12-hour shift,” affirms Basie. “With the capacity to drill 100m more per day, this fully integrated solution has enabled us to improve our production by 80 hours in one month. 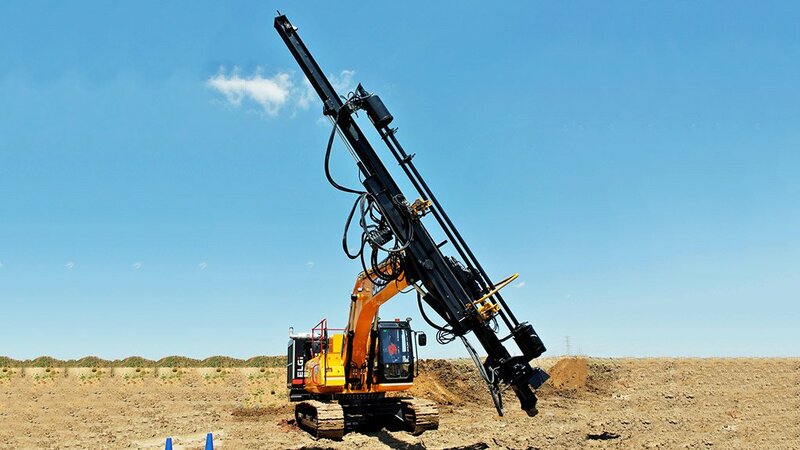 In addition to vastly improved productivity, we also burn less fuel and the operator is less fatigued which has an important safety implication.” Basie also confirms that they can drill from a 114mm to a 171mm size hole. With a simple equipment change (drill rod and base on floor), the rig can reach a hole size of up to 205mm. He adds that the rig delivers a penetration rate of between 65m and 85m per hour, which is more than double the standard rate of approximately 28m. “Our first response when Basie approached us for an excavator for a drilling machine was that we sell excavators not drilling machines,” says Kemach Equipment’s General Manager, Central Region, Mark Peterson. “But we believe that the ability to adapt our equipment to our customers’ requirements is true customer service. 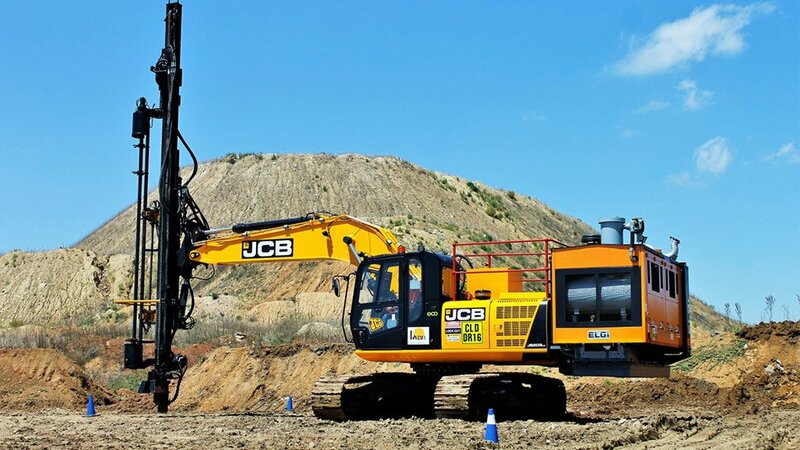 Basie, together with Karl Meÿer from Liyema Drilling, locally designed, engineered and manufactured the bespoke drilling tower to fit the JS205 excavator. Eight years ago, Basie and Karl produced the first drilling tower on an excavator which is still operational. The drilling tower incorporates an automatic rod changing functionality which enables the operator to automatically change the rods from the safety and comfort of his user-friendly ROPS/FOPS cabin allowing him to drill 5m from high walls. Not only is the operator protected from all risks and hazards during the drilling act, but a lot of time is also saved by the fact that he does not need to move away from the 5m area to change rods. The fact that the boom remains stationary reduces wear and tear and extends equipment life. The excavator’s wider 600mm span tracks facilitate accessibility, allowing for drilling to continue even in severe muddy conditions to maximise uptime. Furthermore, the machine’s convenient bolt-on system means no laborious welding is required. The counter-weight at the rear of the JS205 has been replaced with a customised 14 bar ELGi compressor. “We are one of only a few companies that is able to offer highly customised compressor solutions,” says Integrated Air Solutions’ Group CEO, Graham Russell who explains that in close consultation with Kemach Equipment technicians, they shortened the 900cfm compressor from 4m to 3,2m to fit the JS205. “We also fabricated the custom sub-frame to house the compressor,” adds Graham. Bringing the JS205 and the ELGi compressor together is a win-win solution. Compared to a 60m airline link between rig and compressor, direct flow as a result of the on-board compressor requires a much smaller compressor to get the job done. It also eliminates the need for hauling the compressor around behind a tow vehicle. This complete system now only has two engines – the excavator and the compressor - reducing fuel consumption, maintenance and repairs. The drilling machine is also fitted with two separate independent fire suppression systems supplied by Integrated Air Solutions. Suitable for any engine compartment, this triple action system from Fogmaker, Sweden, attacks all three components in the fire triangle - heat, oxygen and fuel. Using high-pressure water mist (50 micron droplets) the system can supress and extinguish engine and hydraulic compartment fires in 10 seconds with only water, and 3% AFFF and cool down the compartment to prevent re-ignition. With no powder or mess, clean-up is fast and easy, minimising downtime. After a discharge, it’s a simple matter of replacing the detector hose and refilling the piston accumulator and the system is ready to go. 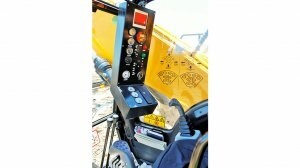 The conversion of the JS205 also included the incorporation of a few additional buttons on the joystick so that all functions can be seamlessly controlled from inside the cabin, putting the operator in complete control. Another important safety feature is the inclusion of a dead man switch that puts the machine into limp mode in the event of a problem. 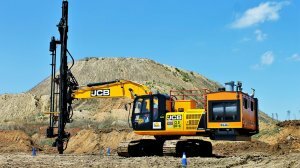 A second JS205 drilling machine has already been manufactured and Basie confirms that the third unit will be ready mid-March 2018. 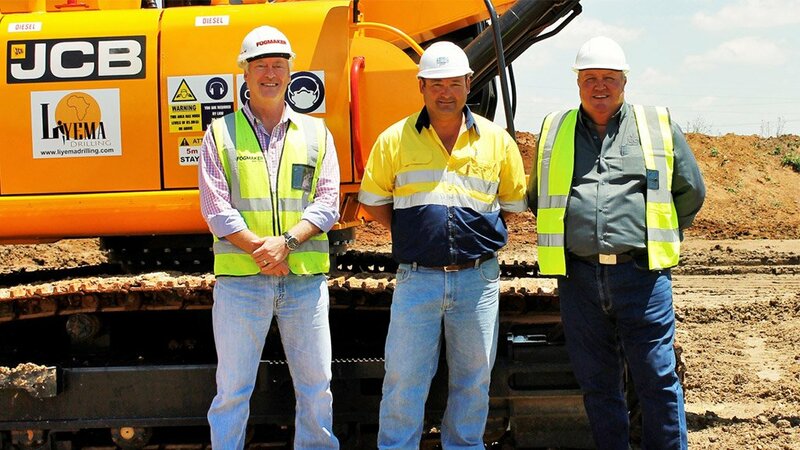 “We keep it simple with accessible parts and quick easy and maintenance, so that the machine is the ideal workhorse for drilling applications on the African continent,” states Basie who extends his sincere thanks to Kemach Equipment and Integrated Air Solutions for their tremendous commitment and support of this innovation. Kemach Equipment has dedicated one person to site and Integrated Air Solutions has appointed a mechanic to support Basie and his team. During the official hand over of the JS205 drilling machine at Kangala Mine on 30 November 2017, Mine Manager of Universal Coal, Pedrie Erasmus, congratulated everyone who was involved in this initiative. Highly impressed with the drilling machine, Pedrie praised the team in achieving all the objectives of enhanced safety, productivity and efficiency.